Preheat oven to 400 degrees. If desired, brush the chilled turnovers with egg glaze and sprinkle lightly with sugar. Use a sharp knife to cut 3 steam vents into the top of each turnover. Bake at 400F for 15-20 minutes or until the pastry is lightly golden and the filling is bubbling. Let hand pies cool for 15 minutes before serving. Serve with Lemon Ice Cream if desired. I love how cute these are! I've never heard them called hand pies before, but I'm with you on the whole cake/pie in my kitchen-not a good thing for me. I like your flavor combination as well-sweet with a hint of tartness from the lemon. mmm... love these pies, I made them a few times when we picked fresh blueberries in the Summer. Thanks for the reminder of how good they are! Those look like a great way to celebrate Pi day. I'm not much of a baker, but those are really tempting. I'll have to keep them in mind for a bumper crop of blueberries later in the year. how very very delisch!!! 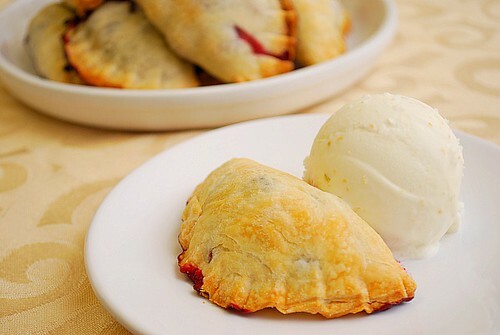 looks like empanada but with the sweet blueberry filling. very clever. By the way, any problems with the filling spilling out? Thanks all! Eizel, I didn't have many pies that had filling spilling out... but I did my best to not overfill each pie (which was so tempting to do!). As long as you fill a little less than you think is enough, your pies will come out fine. Another key point is to ensure there are no cracks in the dough and the pies are sealed pretty well. fork. Worked foe me. LOVE THEM!!!!!!!!! !